« Stroke prevention . . . does statins remain a suspect ? Why patent ductus arteriosus is absent in pulmonary atresia with VSD ? Before answering the above question , there need to be a correction to the question itself . PDA is persistence of ductus arteriosus . In pulmonary atresia ductus itself is not formed .So the question should ideally be Why ductus is absent in pulmonary atresia with VSD ! Ductus has to connect aorta with left pulmonary artery , when pulmonary artery itself is poorly developed or not developed how can the ductus connect to LPA ? In fact , one of the terminologies used for pulmonary atresia with VSD is , total anomalous pulmonary arterial connection(TAPAC) .In fetal life, blood flow in ductus is from RV to pulmonary artery and then to descending aorta through the ductus . When RV is disconnected with pulmonary artery( Rather there is no pulmonary artery ) ductus can not be formed for both anatomical and physiological reasons . Some consider the left 6th arch in these patients would become a poorly identifiable minor Aorto pulmonary channel . 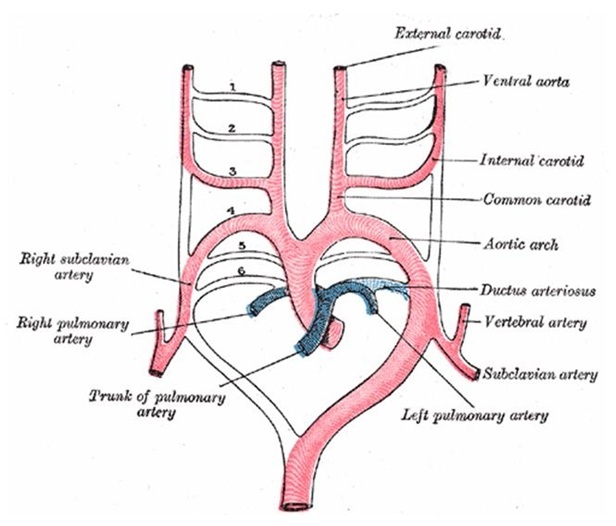 Embryology of major aorto pulmonary collaterals. The lung perfusion in patients with pulmonary atresia is important only after birth, as fetal lung is largely non functional. In patients with pulmonary atresia with intact IVS this becomes critical and usually death ensues unless intervened. If VSD is present it allows the baby to survive as the lung gets perfused by major or minor aortopulmonary collaterals. MAPCOS , if present can connect directly the aorta to hilar pulmonary artery or indirectly from the branches of aorta (subclavian /LIMA/RIMA etc) . These arteries supply with or without a central confluence . It may enter the lung through the hilum or away from hilum .The MAPCOS can be located anywhere from the arch of aorta to descending thoracic aorta.It is very rare in the ascending Aorta . *The natural history directly depends on extent of aorto pulmonary collaterals and its anatomical patency . Embryologically both the major arteries of thorax Aorta and Pulmonary artery have the same parent structure namely the dorsal aorta and its six arches.Hence there is no surprise , when these embryological divisions and fusions goes awry , pulmonary artery fails to get carved out from the dorsal aorta in the normal fashion .The randomly formed pulmonary arteries continue to have link with the parent -dorsal aorta .These are manifested in various ways as major aorto pulmonary collaterals . (It is to be noted in pulmonary atresia , VSD is an offshoot developmental defect . Embryologically VSD is not linked to the primary defect of pulmonary artery development . This is the reason many would consider PA with VSD as a distinct entity with that of TOF (Which is a cono truncal anomaly) This also explains the lack of MAPCOS in true TOF . Hello sir,dat means ABSENT DUCTUS ARTERIOSUS can also occur when the main pulmonary artery and branch pulmonary aretries are atretic in tetralogy with pulmonary atresia? The current thinking is , the term TOF with pulmonary atresia should be avoided instead they become VSD with pulmonary atresia . is not accepted by many .